Router table was a quick win and another thing I’ve wanted for a while but never set out to make it. Just wondering, how convenient is bit changing on your router table setup? Easy. Unlatch router and remove it. Tool Talk on my miter saw station this week….probably. I smiled with tears in my eyes watching that. I’m sure the wife loves you for letting her keep it and showing it to us. My, my, you have improved! Good luck with the schnoz surgery and wishing you a speedy recovery. The stuff you made the last few weeks was right up my alley. I’ve got some skill, but this one was nice to show where you started. I’ll try and replicate your camera stand and get some videos recorded of my upcoming projects. Your project has character. 100 years from now it will be folk art. Wishing you and the wife a wonderful smile filled 2017. Happy New Year mate ??? 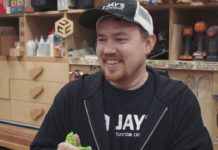 Jay, this weeks vlog was the greatest yet. You said a lot, but you said even more by posting you first build video. It shows people just what can happen if they will just stick with it. You’ve come a long way my man. But don’t stop, you’ve a long way to go. Keep up the good work. 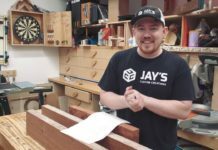 Thanks Jay, encouraging for everyone to see where you started too. I cringe when I look at some of my early stuff. But it also makes me happy to see how far I’ve progressed. I look forward each day for whatever you have to say. I truly feel privileged to have found you. Thank you for your work and sharing. Good video. Made me feel better. I have learned so much from your website. Thanks. Thank you for sharing your first box with us. I have made my first gift box after watching your gift box video!! It turned out pretty good. Thanks for giving me the confidence to do it!! Now I am going back to put a picture in the lid, and a tray as well. I enjoy your videos and am impressed with both your skill and entrepreneurship in this being your living. I’m a bit envious! My sincere wishes for continued success and your family’s good health!